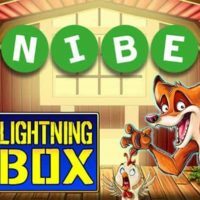 Slot design specialist Lightning Box will set feathers flying with its latest quirky creation, Chicken Fox. The 3×5 reel slot, staged inside a cash-strewn hen house, features every farmer’s worst nightmare – a fox among the fowl. With members of the yard filling the reels, from a wise old goat to the apple-pie cooking farmer’s wife, Chicken Fox’s jovial setting has a dark twist at its heart. The great new game is now live on an exclusive basis with Kindred Group brand Unibet, before general European release across the Sydney-based supplier’s network of operator partners on 20th February. Peter Causley, CEO and co-founder of Lightning Box, said: “We’re thrilled to release our latest title, Chicken Fox, which should cause a bit of a flap. Its comically dark theme will have players chasing chickens up and down the reels. Chicken Fox’s bonus feature is based on a fox catching chickens that can award up to 66x per symbol. The wily critter can also catch eggs that can add further free games, causing massive wins.